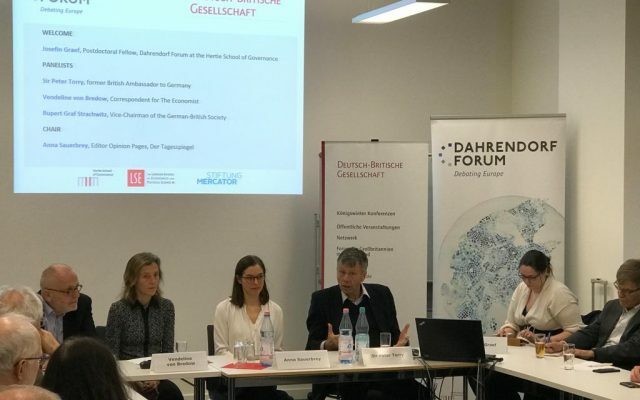 On Tuesday, March 26th 2019, the Dahrendorf Forum hosted a workshop discussion titled ‘Beyond Brexit’ at the Hertie School of Governance in Berlin. The panelists Sir Peter Torry, former British Ambassador to Germany, Rupert Graf Strachwitz, Vice-Chairman of the German-British Society, and Wendeline von Bredow, of The Economist led the workshop. The Proceedings were chaired by Anna Sauerbrey, Editor of the Opinion Pages, Der Tagesspiegel. The first round of questions centered around what Brexit will look like and the odds of Theresa May remaining Prime Minister in the coming days or weeks. The general agreement was that what happens next is anybody’s guess. It was pointed out that if nothing happens over the coming days, no deal is the likely outcome – one favored by only few. Unfortunately, for too long the process lacked urgency and political actors wrongly perceived themselves as having enough time. One potential backdoor could be May’s eventual resignation in exchange for “brexiteer” MPs voting for her deal. Another possibility not to be discounted is that of seeing an even longer extension (past the May 22 deadline), depending on coming developments. Assuming that Brexit does occur in the coming weeks, how would the UK’s relationship to the EU develop and look like? In all likelihood, long talks and negotiations will start. Whether or not the UK will remain, at heart, a part of Europe depends on the type of Brexit we shall witness. A no-deal harbors the potential for resentments that could fuel nationalism. In this context, one must not forget the prospect of a second Scottish independence referendum, or of Irish unification in case of a no-deal scenario. All this would compound to the feeling of dissolution of the empire. It was suggested that governments will have to start thinking much more thoroughly about security in the near future. With the UK dropping out of EU security commitments, and with the current insecurity surrounding NATO and the American commitment to it, continental Europeans will have to bolster their security in order to meet the potential threats on the horizon. Much energy will also have to be spent on maintaining the links that have formed in education, research, and culture. What about the prospect of a second referendum? Although deemd unlikely, it did come up during the workshop. It was emphasized, however, that a second referendum might not be a solution. Surveys and polls show that the outcome would again be narrow, and slim remain-victory would likely be attributable to a change in demographics rather than in public opinion. The panelists recalled that Brexit is an emotional and subjective phenomenon, and that despite the wealth of information that has been added to the debate since the referendum, very few are likely to change their minds: People may be better informed, but not necessarily wiser. If remain were to win, it would be by a small margin. The outcome would be a large disenchanted pro-Brexit minority. Much of the conundrum currently hovering over the house of commons is a consequence of path dependence and the desire of numerous actors to commit to policy solutions that would disenchant one or more constituencies. To put it bluntly, each political actor wants others to take the fall, nobody is willing to commit to a clear path. Some participants argued that a face-saving measure for all would be for parliament to revoke Article 50. That way, few political actors would have to commit to a policy or treaty that is politically unpopular to their constituencies. Should parliament force the government to revoke article 50, however, a general election is the most likely consequence. Furthermore, the question remains to what extent other European countries would wish for the UK to ‘get on with it’. A final question concerned the implications of Brexit for democracy. One idea that workshop participants agreed on was that Brexit may bring about a realignment of British politics. The row of resignations from both large parties, the tension within them along Brexit lines, and the formation of a new group of MPs all point to the beginning of a new era in British politics. This end of the UK’s EU chapter may also be the beginning of a new one.